Numbers speak. BIZPHYX has an unprecedented 100% client certification rate. With over 100+ years of combined ICT, telecom and quality management experience, we've been serving Fortune 500 clients for over 18 years. 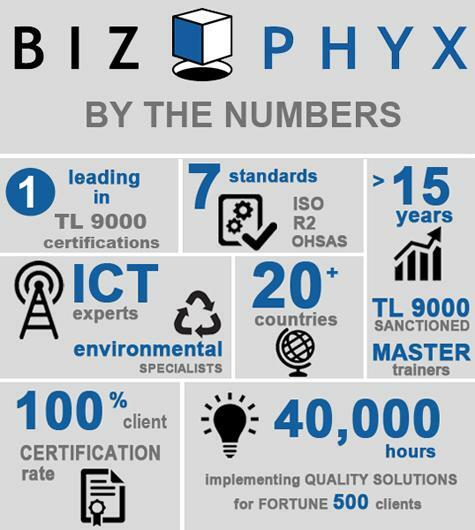 BIZPHYX has 40,000+ hours logged in the USA and in 20+ countries around the globe, executing quality training, auditing and consulting projects in 7+ standards and practice areas such as TL 9000, ISO 9001, ISO 14001, ISO 50001, ISO 45001, Lean and Six Sigma. Think of us as your quality management and environmental management toolkit. BIZPHYX assists clients in three primary areas of quality management; certifications (implementation consulting), training and auditing, focused on a suite of standards, with which we have extensive experience. Focused experience is one of the reasons we have a 100% client certification rate. We deep dive these areas, working with clients to meet their specific project goals and achieve quality certification(s). For example, while we may train a client's staff to conduct internal audits, we may also work with them in a third-party capacity to conduct suppliers audits, deepening the value of auditing in their quality system. For us it's all about quality management services and quality standards. Reputation speaks. BIZPHYX is a certified Women's Business Enterprise (WBE). We are members of the American Society of Quality (ASQ) and Women's Business Enterprise National Council (WBENC). BIZPHYX is also a member of the NQA Associate Consultant Program, listed as a global consultancy on the NQA ACR. We offer clients additional resources such as access to a robust knowledge base and quality blog. Our goal? To deliver quality management solutions that allow you to meet supply chain requirements, improve your bottom line and help you keep your customers for life. Our team includes TL 9000 certified Experts and Quality Fellows. BIZPHYX also has a Certified Environmental Specialist (CES) on staff. of TL 9000 sanctioned courses until 2019.
together, let's find out where quality can take you. "We are fans of BIZPHYX! The templates, information and training provided by BIZPHYX make implementing ISO 9001 and TL 9000 a manageable process – especially for a small company. Without BIZPHYX's assistance, I can see how companies would create and implement large, complex processes trying to comply with all the requirements. They're a great company with great people to break down the process so that it is easily managed for a successful outcome!" "The process of creating a written quality improvement plan and receiving ISO 9001 and TL 9000 certification has been richly rewarding for UNDC. BIZPHYX has created a process that makes the task manageable and provides support every step of the way to guarantee success..."